Let me be the first to say: you are one sweet guy, Ward. I'd say Andrea picked a winner. Nice illustration, beautiful sentiment, dude. Good Job on the pic...so true! very nice i dig the colors and the style. plus being a parent must take alot of stregth. both physical and otherwise. Very nice Illio. I like the style. And I hope Andrea liked it too. Great Illustration and nice message. I'm sure Andrea appreciates it. You have a really nice graphical style. Cheers! I always like a man that can bare his soul to the world! Really gorgeous colours and illustration. Great illustration and such a wonderful tribute to your significant other. Fantastic illo. You are really good....though, I suspect you are aware of that already. I love those elastic arms and the the action in Ezra's arm, not to mention the off-register feel of the color. This is one solid piece of work, m'man. Props! Wonderful Ward! Ahhh whata sweety! Like your artwork and a lovely tribute! What a forbearing expression. Brings me back to the good old days of being mauled by my kids. Wonderful, Mr. Jenkins. Hope she didn't have to pose too long for you. And lord willing, you'll be able to ride that killer arm all the way to a fat major league contract. I hear she can arm wrestle truckers into submission, too. Great illo. I was wishing you were her last night, Ward. I went to a cocktail party where I met none other than THE Irwin Chusid, who compiled and wrote "The Art of Jim Flora"!!! We talked about how we both LOVE Jim's work, and I mentioned you and your admiration as well. I got his contact info, so I plan to send it to you. I told him about your blog and your interest in collecting and writing about retro illustrations. There was also a screening of the documentary on Esquivel!!! You would have LOVED it!!! I kept thinking of you, Steve, Doug, and Primal's aesthetic! Thank you guys, for all the great comments on my drawing! Very appreciated. Justin, I'm so envious I could just spit! Yes, I'd love to get in touch with Mr. Chusid. He did a great thing putting Jim Flora out there in the public's eye. Glad you're having fun in great NYC. I meant to say "I was wishing you were HERE last night" in the beginning of my last comment. Anyway, you and Chusid need to have an email conversation sometime. You guys are into the same stuff. Ask him about Flora. He told me he had to convince the Flora family NOT to put their dad's work on E-bay! Can you believe it? They took Irwin to a storage space where all of Jim's drawings were kept. One of Jim's daughters hates her dad so much, she said she wanted to set fire to the storage unit! Luckily, Irwin convinced the family they were sitting on a goldmine, and persuaded them to allow him to compile Jim's unpublished pieces in a book! I'm a fan of your art. Wonderful, great illos. I'm so honored, really and truly. thank you so much, love. i love the colors and I have seen that expression on Andrea's face before--you captured it perfectly! beautiful image, very touching and wonderfully executed. 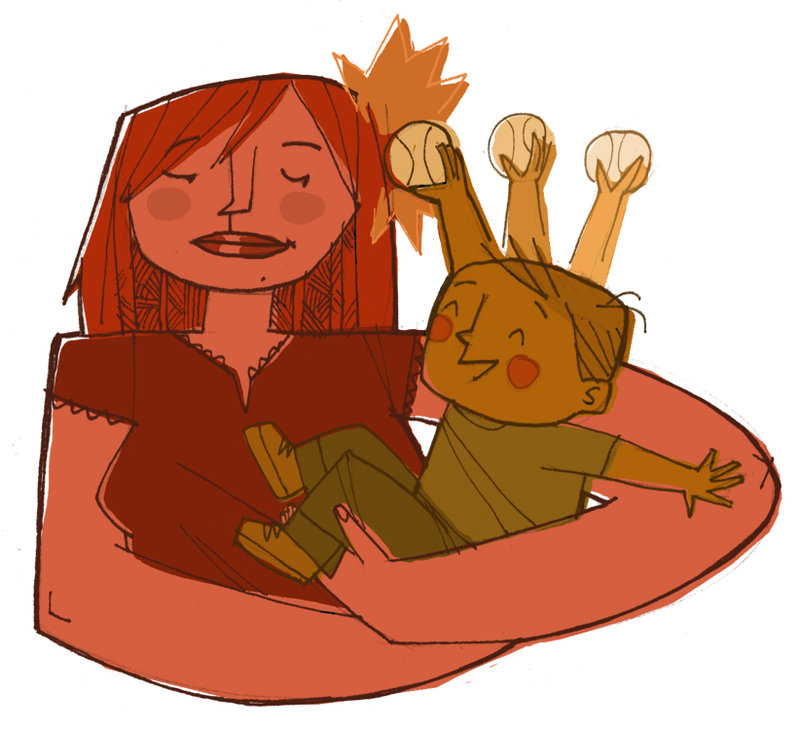 the strong yet soft rosy colors of your wife with the oversized encircled arms holding her yellow "ball of energy" boy and giving him the bemused mom look is very well thought out. beautiful.